High-precision Main RC oscillator with 12 MHz default frequency for device startup. In-application trimming access for frequency adjustment. 8/12 MHz are factory-trimmed. Two Analog Front-End Controllers (AFEC), each supporting up to 12 channels with differential input mode and programmable gain stage, allowing dual sample-and-hold at up to 1.7 Msps. Offset and gain error correction feature. Integrity Check Monitor (ICM). Supports Secure Hash Algorithm SHA1, SHA224 and SHA256. 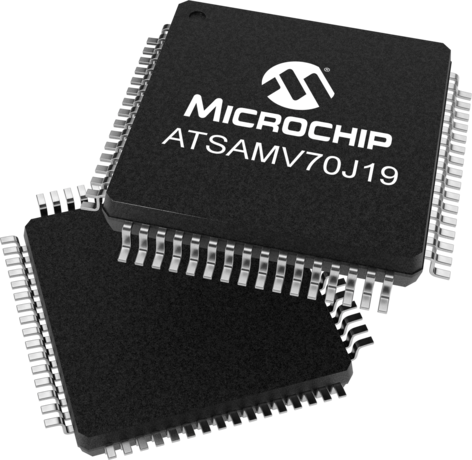 The Microchip SAM V70 devices are a family of Automotive Flash microcontrollers based on the high-performance 32-bit ARM Cortex-M7 processor with a Double Precision Floating Point Unit (FPU). These devices operate at up to 300MHz and feature up to 1024 Kbytes of Flash, and up to 384 Kbytes of multi-port SRAM which is configurable Instruction and Data Tightly Couple Memories to leverage the advanced DSP capabilities of the core. The SAM V70 series includes a HS USB Interface with integrated PHY, dual CAN-FD, QSPI, MediaLB, CMOS Imager interface, TDM/I2S (SSC,) multiple serial interfaces as well as on-board hardware cryptography including a TRNG, AES-256, and SHA-256 engines. The ATSAMV70 family is AEC-Q100 Grade 2 qualified. The standard device does not go through the automotive production flow, and there are two options for ordering devices with the automotive production flow. 1) A customer specific part number will be assigned and designated with suffix to the base part number (i.e. ATSAMV70J19B-AABV02.) A customer specific PPAP is available on request. 2) A generic suffix will be added to the base part number (i.e. ATSAMV70J19B-AABVA0.) A PPAP is unavailable for these devices. Please contact your local Microchip sales representative for additional information.